Our homes should be a space to thrive in, and one big part of that is to connect with those we love. We need spaces that support our lifestyle, from family-friendly areas to gathering spaces for entertaining. Here are a few areas to consider when creating space in your home for connection. The living and family room areas, whether formal or casual, are our primary social spaces. Many clients are opting to forgo a formal living room in favor of creating a single, more casual space that better fits everyday life. Include plenty of comfortable seating. The space may ultimately dictate the scale and number of furnishings, but the idea is to create a space that encourages conversation. Consider an arrangement where seats face each other, or with accent chairs that face the main seating area so that the grouping creates a natural conversation area. Include accent tables and lamps. Make sure every seat has a table within reach for a beverage or book, and adequate lighting for reading and comfortable conversation. Layer in soft textures. From throw blankets to pillows, baskets to picture frames, include a variety of textures that add natural warmth and comfort. Add in a soft rug to absorb sound and to provide a safe and comfortable place for young children to play and explore. Hide the TV. Televisions are getting bigger and bigger, and entertainment accounts for a significant amount of the time we spend in the social areas of our home. But the TV doesn’t have to be the central focal point of the space. Whether you use sliding or bi-fold cabinet or barn doors, a pull-down map, or a custom art or mirror installation that folds back to reveal the TV, having an attractive way to conceal the TV eliminates the distraction and visual weight when it isn’t in use. Add natural elements. From fresh flower arrangements to vertical gardens, to fiddle leaf figs or a boxwood swag, bring some nature in. Natural elements are calming, nurturing, inviting and visually attractive, and help the space feel more complete. Build in storage. Social spaces mean a collection of books, electronics, toys, and other media that can accumulate and feel cluttered. Well-designed built-in storage can provide a place for everything and add an attractive millwork element to the space. If the layout allows, built-ins can include seating as well, such as a window seat bench. Kitchens have evolved over time from strictly utilitarian to an extension of the entertaining space. They are the hub of the home, with far more than food prep taking place throughout the day. At the same time, formal dining spaces are commonly giving way to more casual dining spaces and flex spaces that can adapt to a family’s needs when they are not being used for formal entertaining. Consider an open plan. For both daily family life and for entertaining, create a kitchen space that allows for conversation to freely flow into and out of the kitchen. Having a dining space that is adjacent to or a part of the kitchen allows the conversation to continue as the meal progresses from prep to table. Incorporate an island or peninsula if possible. A large island or peninsula bar with seats will create a conversation area in the heart of the kitchen. For entertaining, it can allow family and guests to assist with prep and socialize at the same time, and can double as a casual dining space. Include decorative lighting and comfortable seating. If your main sink puts your back to the room, consider adding a prep sink on the island or peninsula to keep prep going without missing out on the conversation. Add appropriate lighting. Kitchens need a mixture of task lighting, ambient lighting and decorative lighting. In addition to adequate general lighting and natural lighting, consider adding lighting below the upper cabinets, inside the cabinets, in the toe kick space, and even above the cabinets if they do not reach the ceiling. Additionally, decorative pendant lights or a large light fixture above the island, peninsula and/or dining table adds both ambience and visual interest. Create a buffet. For informal gatherings where dinner isn’t served at the table, create a buffet that directs the flow of traffic. Likewise, create a bar/ drink station that doesn’t require guests to enter the primary prep zone to get ice, water or a beverage. Set up a flex space. If you have a dining room you use once a year, consider converting it to a flexible space. The room can become a home office, playroom, craft or homework station when it isn’t used for dining. Add built-ins to house craft and office supplies, toys and electronics so the room can be transitioned to a dining room when needed. Regardless of the size of your indoor living space, your exterior can be an extension of your entertaining space and make gatherings both more comfortable and fun. Create zones. Create a mix of open and covered patios to create multiple small gathering spaces and encourage conversation. Set up an outdoor kitchen. Have a station for grilling and a bar area or drink station. If space and budget allow, complete your outdoor kitchen area with a prep sink and ice maker as well. Entertaining tip: For a large informal gathering, be sure to allow space for multiple coolers. Keep extra towels and napkins nearby too. Add furniture and accessories. Create a casual and comfortable living space with an outdoor rug, furniture and pillows that encourage conversation and connection. Add seating. When entertaining, provide plenty of extra seating, and add extra tables for outdoor dining. On hot days, opt for additional table umbrellas for sun protection. On cooler days, consider bringing in portable heating. Light it up! One of my favorite elements to add is string lights. They are great both in and around covered patio areas, as well as overhead in open spaces. create the perfect ambient sparkle and glow when the sun begins to set. Additionally, if your patio area includes steps or pathways, consider lighting those as well, both for safety and for ambience. Include natural elements. Particularly if your outdoor living area consists mostly of hardscape, the addition of plants will immediately bring the space to life. Include a mix of different height containers, as well as vertical gardens, to create an outdoor environment that is both inviting and relaxing. Add a fire feature. 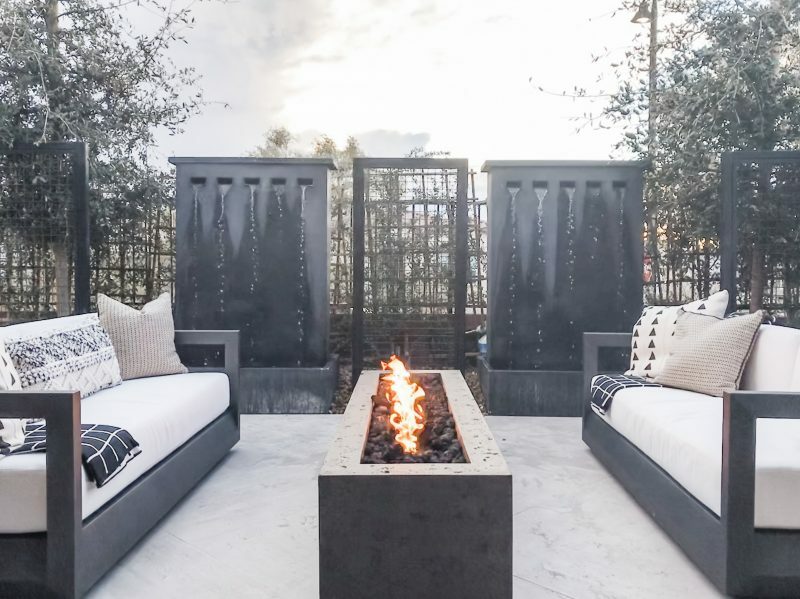 Whether it’s a fire pit, chiminea, fire table or fireplace, there is nothing like the warm glow of a fire to create comfort and encourage conversation. Bring the music. Invest in some quality outdoor speakers to set just the right mood for your gathering, from soft and mellow to upbeat and lively. 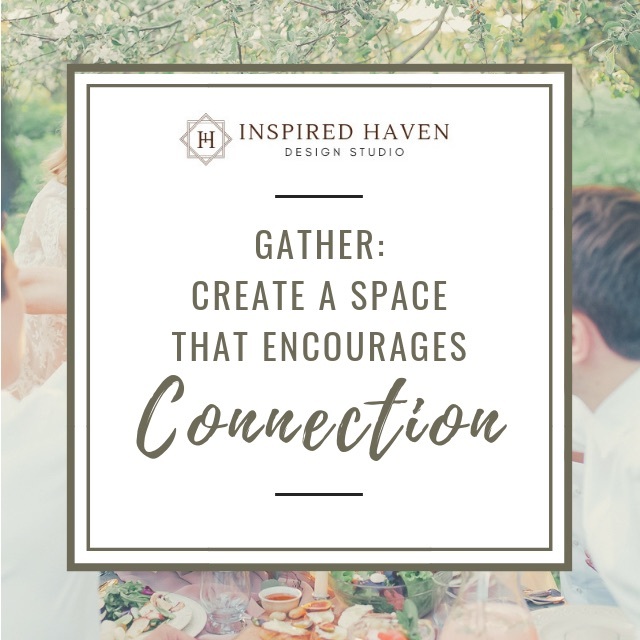 Whether you entertain often or not, host informal get togethers or big events, or just want a space for your family to share at the end of the day, these are the three spaces that can have the greatest impact on your sense of community and connection at home. Some may require a change to your current floorplan but others are fairly simple to incorporate into the home you already have. If you’re considering a remodel and want to make sure your new space is a place of connection, consult with a designer you trust who can help bring that vision to life. My service packages range from consultation to DIY design coaching, to concept boards, to complete layout and specification services. Most of my services are available in person or online. Contact me today to get started! « Major Changes: Should We Remodel or Move?